There is only one thing better than Free Shipping Water-Jet cut $16.95 a Square Foot Ocean Gray Arabesque and that is a company that sells all the matching trims so you can finish this job. Brilliant White Arabesque Mosaic $17.95 a Square Foot. Another iPhone warehouse picture: The Brilliant white Arabesque Mosaic Tile and how white this product really is can be seen fully here. It is an amazing look and backsplash design as this covers a square foot it is effectively half the price of the competition at $17.95 a Sheet which covers a Square Foot. I am very proud of this product. Every one else makes it smaller, sells it for more. We have tried to cover everything a full square foot (just slightly over), Fused Back and 8mm thick for stability attached to a mesh for ease of installation. We have checked every box a comparable $50.00 a Square Foot product would cost, go ahead order a sample, take it to the retailer. (then please let him know where he can buy it, as his supplier will not be as good). Exceptional Price (even though it is short term). Incredible Quality, order a sample or zoom in on this image. No games – sold by the Square foot Sheet covers a square Foot. Brilliant White with green tint removed. Mesh Mosaic for ease of installation. $17.95 a Square Foot Ocean Gray Arabesque Mosaic Tile available online from The Builder Depot no Gimmicks or games premium glass mesh backed mosaic tiles at great prices. Each Glass Piece on this Arabesque can be summarized from the drawing above. This is on a mesh for ease of installation. This is so confusing someone check my math! It is in my opinion advertised at one price but actually sold at another? This is probably just a big company. They trusted the 3rd party who uploaded it*. It could be the people in charge are so far detached from the front line they cannot see any mistakes. *I have to guess because I am just sent a screen shot of the product, all the company information is removed. This is done so I make unbiased views and not upset anyone. Most likely there are too many lines who can know them all? I do not know, I am guessing, (I was just passed this picture with all company information removed, as I ask for this to be done, so I can make a blog about the product screenshot without any bias). I am not this company and would never presume to judge. One thing is fair, once you have millions of products, let’s just assume they do the site looks to be on a platform that would cost a few hundred thousand, there is no way to be 100% accurate on all of them. We can struggle with just 2,000 products and customers occasionally point out where we have put honed instead of polished. So I am definitely not throwing stones in glass houses. My point is not the price error but either price is this is either $24.15 or $33.99 a Square Foot, we are a lot lower at $17.95 a Square Foot and Free Shipping. You may be thinking….”Our Glass Arabesque is not one of those if it is too good to be true”. It really is the correct price and quality. Glass kiln fused back and 8mm thick. We simply earn a whole lot less and do more with less people. We currently offer in 2 colors Ocean Gray and Brilliant White. The price is a short term promotion (prices valid thru March 2015). This is a mesh backed mosaic for ease of installation. Or view entire collection here of Brilliant Glass Tiles, with trims and field tiles all designed to match and FREE SHIPPING! While the promotion is short term the quality is excellent, we just want our customers to try it get it into the market and for that we are prepared to make very little margin. If you buy at this price then you have made a great deal as this is 8mm premium glass tile the thickest of the glass tile with a kiln fused back like all our other glass tiles. It will be your Instagram pictures, your word-of-mouth and referrals that grow our business we are 50-60% referral based growth. How can we do this. Well this is two areas marketing and of course our always strategy of “No Frills Marketing” this is not going to be in a magazine. The image above is an iPhone in our warehouse, costs. No marketing experts here (not even a proof reader so again I apologize for the grammar in the blog). 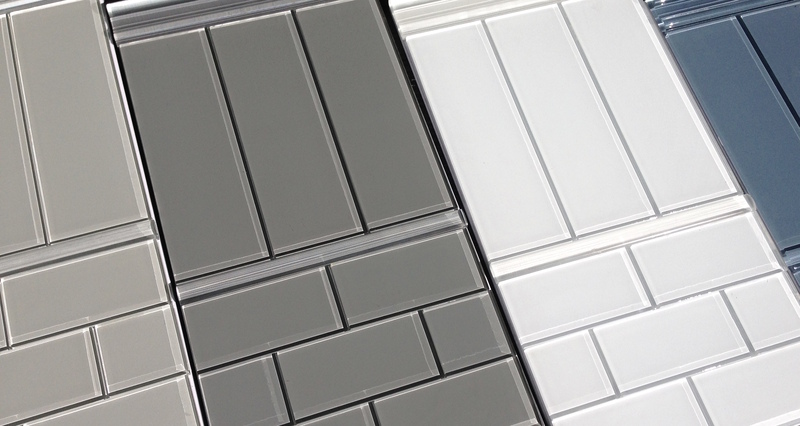 Just to help with how the Ocean Gray and Brilliant white look together here they are as tiles ($9.95SF). Part of the Glass Tile collection. Set to arrive in about 7 days, very excited this is Ocean Gray Glass Tile Arabesque. The market has been charging $25.00 a square foot for this. We will have to run the numbers but as usual plan to come in around $17.00. Well below any competition. But just two colors. The white and the Ocean Gray. We purchased volume and that limits colors. But keeps costs low. Update: Arrived $17.95/SF and in stock! How do you get your Brilliant White so White? What makes Brilliant White glass Tiles so white is a great question. I have looked on Houzz.com and on the internet and it seems that people are really struggling with this, it really is sad. I see a lot of questions and concerns online. So as someone with decades of glass tile experience and having worked on the floor above a glass tile kiln I thought I might share. Let me take you on a little journey though my brief history to explain why Brilliant white glass tile is so Brilliant white. So that when it goes on a bloggers well known site with tens of thousands of followers and up for over a year he is not saying why is this Brilliant White bloody Green? Instead it is perfect. Many years ago, (decades ) I worked for a Glass Tile manufacturer (I have worked for two one is the worlds largest, but that is a side note), we were many things tile but one thing we manufactured was glass tile, boy that kiln was nice in the British winter. Initially in the early 1990s white glass was very difficult, and extremely expensive as time progressed we improved and so did others. Glass has Iron content, this is a natural deposit in the manufacturing process. It is this iron content that gives glass a natural green tint. It really has no impact on colored glass as you can adjust the coloring to take that green tint into account. There was a lot of science behind it but long story short remove the iron content and the glass becomes clear. The process is expensive somewhere around $1-$2 a Square Foot (today), though we take the margin cost. We do this so we can offer a ‘clear’ price structure. (It used to be $20 to $50 a square foot to go through the process, it was market prohibitive). By 2000 in the UK we were experts, actually late 1990s. But this product; this perfect white glass at a reasonable price needed a name. The name or brand “De-ironization white glass tile” did not really have a marketing ring to it. So not, I repeat not (I claim no responsibility any marketing involvement in the name) being in this marketing meeting they decided on the term “Virgin” white glass. At that point I suppose they had not really thought of the global implications, they were just thinking pure. Would have been better off with “Pure White”. So after spending a lot of money this name was marketed and for sometime even the foreign companies accepted the term, reluctantly. Over the last fifteen years that term has died out. As other companies have copied the process. (I suppose how the wireless became the radio). Really the term did mean a lot of negative things on the global stage, and back in 1990s that was not really on the minds of the British. So here we are today with our white glass tile. A true white glass tile, without the green tint has been through a process to remove the iron content. Considering where the process and name of “Virgin Glass” was coined, I decided an ode to the British was in order. I decided “Brilliant White” should be the name, it is a British word “Brilliant” and put with White, sounded fair. So that is what we call it. So today if you are looking for a glass tile without the green tint you would need to buy “Brilliant White” Glass Tile. Here you have it, on top is a glass tile with the iron content removed. $9.95SF and Free Shipping (thru March 2016, then we will review costs as we keep margins as low as possible) for 3×6″, 4×8″and 4×12″Glass Subway Tiles along with trims including the very popular Brilliant White Glass Dome on our glass tile page which you see breaking up the 3×6″ and 4×12″ tiles. You can see the difference look how pure and white the product is. Why do some people sell white glass with a green tint. They do not have any knowledge. They did not work in a factory or for some other reason. But you need knowledge and your supplier needs to know you have been in this industry for some time. You need to be able to examine their process and quality control, perhaps improve the process, perhaps invest. Treat them as a partner not a supplier. I apologize for any grammatical errors I am not a great writer, just have knowledge of factories and manufacturing. For some I hope this helps. We are not photographers, it was a sunny morning at the warehouse today. But some tiles together and took this with an iPhone. I like the White it just shows how white it truly is. That is the challenge, you have to use a Virgin glass. Then kiln fire the glass tiles. Ensure they are 8mm thick and then you have checked all the boxes. How can the competition compete? Most likely thinner (so look out for that). That is the only really way (other than not using a kiln), we could make this as a 6mm tile and take off a $1.00SF, perhaps $2.00SF, but why, why not go for the best at what is already an incredible price! We have this in 2×4″, 3×6″, 4×8″ and 4×12″ along with trims on our collection page here. All the tile are $9.95 a Square Foot and Free Shipping for 2015. For an iPhone and a sunny morning, this was not a bad photo. So the glass situation is really simple. It is a man made product. It is made a couple of ways the best is ours and mostly others today which is kiln fused backer and then the white glass should be made from virgin glass tiles. So why is everyone else so much more? Because people keep paying for it, and not everyone knows about us. Will we keep it going or join the $15 crowd, not sure, it really depends if it continues grows as a line then we know the consumer is getting looking, doing homework. If people are willing and actually prefer paying $15.00 a Square Foot because they feel better about doing that, then we have to do what the consumer wants. But I think our customers are on the same wavelength. Make it the best you can and do not be greedy on selling it. Still like this picture, can you believe an iPhone got this. Amazing.